Ian Chadwick is a Toronto-based freelance writer and editor. 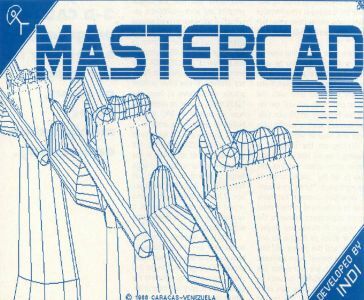 MasterCAD (herein called MC) is a 3-D CAD program originally from a Venezuelan company called I.N.D.I., brought to the English-language world by Michtron. This is one of the more expensive CAD programs available for the ST; however, it does not live up to its promise, despite a wealth of features and commands. If you can get past the limitations, poor documentation, bugs and occasional crash, you can produce some spectacular 3-D drawings. Getting to the output stage, however, is frustrating and seldom worth the aggravation. 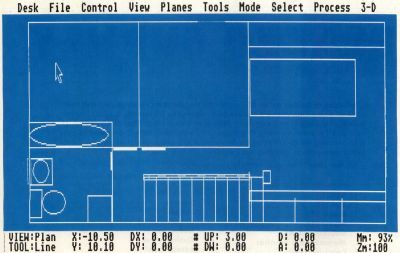 MasterCAD uses a straightforward menu system for commands. This makes it easy to learn and use them. Like many Michtron products, MC's first major problem lies in the documentation—almost 300 pages which fail to adequately describe the program's commands and features. It's not merely the awkward English that plagues the writing. The screen shots often don't match what the program shows, and few are labeled to follow the text. The command descriptions are sparse to say the least. Aside from failing to cover a tenth of the available commands, the tutorial fails to explain why you're doing what they tell you. The commands and menu selections themselves are minimally documented and seldom discuss problems, solutions or give adequate examples. There is no glossary of terms. Finally, nowhere are the file structure and program limitations described (including number of objects or groups). For the most part, the manual is only marginally useful, and you'll have to experiment to learn properly how the program works. The manual recommends the user refer to a READ.ME file, but there was none on the disk provided. There are also no error messages in the program; so you won't know what is happening if you do something wrong. The manual has no warnings or caveats about potential problems or solutions. There are also some great sample pictures in the manual, but none are included on the disk. If they had been, it might have made it easier to learn how they were constructed by dismantling them. MC uses a straightforward menu system for commands. This makes it easy to learn and use, but the total lack of keyboard alternatives is extremely frustrating. Undo doesn't do anything, nor does Delete. The manual (page 162) says that "MasterCAD will provide on-screen help at any time." It does nothing of the sort. Help is a dead key. Most of the time, Return doesn't work in a dialog box either. For a simple example, to delete a single line, you have to pull down the Select menu, choose Elements, select the line on the screen, click the right mouse button, pull down the Process menu, select Delete, then confirm the deletion (pressing Return won't work). That's six steps. It would be better if Undo simply undid the last action. Or if you could double-click on an object or element to select it, then press Delete. MC's many-stepped processes more than tripled the time it took to do a drawing I had done previously in 20 minutes on DynaCADD and CAD-3D. MC has two methods of creating 3-D objects. Symmetrical objects are created in spin mode. In plane mode, object dimensions are extended 90 degrees from the viewing angle. That is, you create a cylinder by drawing a circle, not a sphere. There are no simple object primitives such as spheres— they must be created manually using the spin and arc tools. This isn't difficult, but requires some trial and effort to learn how to do it properly. It would be considerably easier if MC graphically retained the screen locations of the cursor at various button clicks. There is also no means to add, merge and subtract elements—in either 2-D or 3-D mode—as there is in CAD-3D. You can only delete or group. Like many Michtron products, MC's first major problem lies in the documentation— almost 300 pages which fail to adequately describe the program's commands and features. The MC workscreen displays a simple grid with optional grid on/off, size and snap. However, unit size is limited to meters, inches, centimeters and millimeters. If you change the units, the grid can unaccountably disappear. Also, the grid selection box will change, asking for a different sort of input—a change not described or explained in the manual! If you change the proportion of an object (or several), they won't snap to the grid, even if it was turned on when you changed the size. This can be exasperating when you're trying to alter the size of several objects to fit exact dimensions. 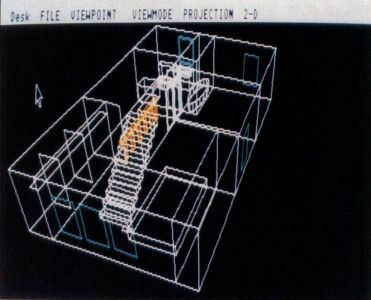 The 2-D view of the drawing can be worked on in plan (view from above), front, back, left or right views, but only one view can be seen at a time. (There are no alternate view windows.) There is nothing on the screen to indicate which direction is the nominal up. Some experimentation showed that the bottom of the screen is the "front" for viewing purposes. You can switch to a 3-D view and change the viewing angle to examine the drawing in wire-frame or filled-plane perspective view, but you cannot work in 3-D mode, only look. There is no hidden line view, so side or front views can be very difficult to understand if there are many objects or lines. Even if you specify a limited area with the planes command, you still see every line. However, on the plus side, the drawing area is comfortably large and easy to work in. Working on the inside of a drawing—say an interior wall in a house plan—often requires the user to set the "plane" to get to the right place. Planes are a poorly described concept but fairly easy to understand in their most simple applications. However, the discussion of planes and projections is about as opaque as one can get, and the novice will find himself or herself more confused by it. Planes are somewhat like "levels" in FirstCADD, but with far greater flexibility, since they work in three dimensions and can be angled. The results of working with them often are not what one expects from the description. It's unfortunate that the documentation doesn't do them justice, because the concept is one of MC's shining lights. MC supports color in medium and low resolution. Objects and elements can be colored or shaded according to the available palette. This is useful for highlighting certain parts of a drawing. However, I have not been able to figure out what the criteria is for coloring an object face in filled-plane mode. Some objects seem to be colored on faces 90 degrees to what I want, and there is no method I can find to determine the colored faces myself. Drawings may be saved to disk as a whole, or selected parts can be saved and loaded (import and append). However, with no information on the file structure, you won't be able to use MC objects or drawings in other programs, except as 2-D DEGAS-format pictures. In order to print a drawing, you must save it in an MC print file first, leave MC, load the output program and print—awkward, especially if you want to print several pictures of the same object from different angles. The program is set up for Epson FX-80 or compatible dot matrix, Atari SLM804 laser printers and three Hewlett Packard plotters. If you have another printer, you'll have to have the GDOS driver, as well as understand how to install it—MC doesn't bother to explain the process. MC also uses GDOS for several fonts in the ASSIGN.SYS file, but again this is not explained in the manual—neither is how to change fonts or drivers. Nor is the text feature itself described; no mention of how to change fonts, sizes or text attributes in the manual. It appears you can only work in the single font provided. There is no dynamic-view mode so the user can change the angle of view in the draw screen interactively. It's always 2-D. In the 3-D mode, the method of selecting the view mode is easy, but inaccurate. Although it uses a visual method of positioning the cursor on the screen, and the X, Y, Z coordinates are displayed on the bottom information line, you cannot specify the exact viewing location by coordinate or specify a zoom level in 3-D mode. However, the zoom level (1:5 to 1:1000) in 2-D mode affects the 3-D image. There is no definable universe size, and the limits of the universe are not stated. There are no means to set alternative lighting for the filled-planes (solid) object view. There is no "cut and paste" function, so you cannot copy an object from a front view—say, a window—to a side view. You could conceivably copy it from the front to a location outside the house plan, change views, rotate it 90 degrees, then move it and place it in the new location: a tedious process, one which demands many corrections and finicky adjustments. There is a clipboard file which saves selected objects, but you cannot selectively load any of them; the entire contents of the file are loaded when you use import. While you can group objects and elements together into larger objects, you cannot subtract objects from groups. You must deselect individual elements (lines), one at a time. A lot of painstaking effort is required to actually create a detailed drawing, say a house plan in 3-D. There are no simple means to stretch or alter a line or object once drawn. Instead, it must be either deleted and redrawn until correct or "proportioned" using the visual sizing tool, which changes size in two dimensions. You cannot simply lengthen it. Proportioning is an annoyingly inexact process. Worse, perhaps, MC is subject to mysterious crashes. On three different occasions, I tried to do a 3-D filled-plane view of a complex house plan (with many objects and elements). Up to a point, the program worked, but when the drawing reached a certain, unspecified complexity, it would hang. I left it for over an hour each time before deciding it wasn't merely being slow. MC competes most directly with CAD-3D. But, while MC has some nice features and some slightly smoother user-interface routines in places, it can't stand up against CAD-3D, either in features or secondary support. MC is simply more difficult to use than CAD-3D and has fewer options. Overall, MC gives the impression of being designed and implemented by programmers, not CAD professionals. It has some whizbang in it, but it still has an amateurish feel about the interface and command structure. While more versatile in many respects than FirstCADD, it is too clumsy for speedy or efficient work. For all the features it offers, MC lacks many options and commands provided in many other 3-D CAD programs, especially in the areas of input, object manipulation and scaling. Finally, the abysmal state of the manual makes the price tag far too high. Michtron is in dire need of professional editorial help. There's a solid core here, however, and Michtron should rethink the entire program (and manual) design for a new edition. A Version 2 release should take serious consideration of competing products, and CAD professionals should be asked for their suggestions and requirements.